The videos and content in Week 2 of the Science of Well-being course mostly focused on dispelling misconceptions we have about happiness. Professor Laurie Santos talked a lot about, and referenced studies to back her point, how a lot of things we perceive will make us happy, or sad should we not get it, don’t have nearly the impact we think they have. That’s because our intuition for predicting happiness is terrible! Professor Santos didn’t frame it in the following way, but it seemed to me our intuition for what would make us happy is very much based in the amygdala that’s the emotional centre, and reptilian part, of our brain that’s old, more animal-like and limited. Emotional intelligence, as a concept, is the ability to control this amygdata with the rest, and more rational part, of the brain, the part that knows waiting 20 minutes for 2 marshmallows instead of taking 1 now will bring you greater benefits when you are as young as 4 years old. That was the key to the Stanford Marshmallow Experiment that showed having delayed gratification as a trait in a 4 year old who first starts to think, is a better predictor of success in life compared to any other tests like SAT scores, education attainment, BMI, etc. That animal instinct suggesting what might make us happy is a very simple and basic form of processing that gets predicting happiness, and especially lasting happiness, all wrong. Professor Santos started her case on how bad our intuition is with a visual metaphor of some optical illusions where lines appear to be unequal in length, or tables unequal in size, when they are, in fact, equal. Not being fooled by the optical illusions wasn’t the point, though. Rather, it was despite knowing those objects were equal, our eyes still cannot “see” them that way. They still appeared unequal. This idea of knowing, but still not clearly seeing, contradicts the concept of “knowing is half the battle” that was the moniker of the GI Joe cartoon series in the 1980s. This fallacy, then, was named by Professor Santos and another colleague as the GI Joe Fallacy. I guess in their minds, you don’t win half of any battle, you either win it or lose it. This is a term I coined for the following fallacies regarding predicting what makes us happy, in a play of words off the GI Joe Fallacy name by Professor Santos. These are fallacies all of us are susceptible to, even after we become aware of them, due to the GI Joe Fallacy idea. They are a collection of misconception that people, and general society, has about what might make them happier in a lasting way (i.e. beyond an immediate moment or two). It will be hard for many people to believe what Professor Santos described, which I’ve summarized below, with references she gave, but the research is there to support it! I would recommend you sign up for the free Science of Well-Being course rather than just read my summaries of them. I do put in a few thoughts and insights of my own or elsewhere I had come across, though. Professor Santos references a study by Gilbert et al. in 1998 where participants were asked about how unhappy they’d be if they didn’t get a job they really wanted. There was a predicted 2.10 point drops by the participants (on a 0 to 10 scale), if it turned out they didn’t get the job due to reasons they thought would be just and fair. There was only a slight drop of 0.68 points. For when the people didn’t get the job because of unfair reasons, they thought they’d be just about as unhappy, with a 1.90 predicted point drop. However, there was zero difference in their happiness when they found out they didn’t get the job for reasons they could not control! Key message here? Convince yourself it was due to something stupid and not fair that you couldn’t have controlled (i.e. it wasn’t YOUR fault) and you won’t be unhappy about getting that job at all! Now, that’s not to say you should just lie to yourself like that. There’ll be a lot of consequences for not being accountable and living a lot of lies in your life sooner or later, but it seems to work for a lot of people. From my experience, do a real analysis. Sometimes, you will find you didn’t get jobs for stupid reasons, like office politics, systemic and/or real discrimination, among other reasons. That honesty will not put it all on you every time, and that balance is not only better than it being all on you all the time, but it is also enlightening to see how the employment world truly works. Professor Santos’ teachings did not mention that the ability to justify something to yourself, no matter how ludicrous so long as you can yourself to believe it, can be a huge factor for minimizing unhappiness you might get from something. I don’t have any papers to cite to support it, in general, but there are other works I’ve seen that generally supports this for specific cases, like the examples Professor Santos gives with not getting jobs but being able to satisfy yourself that it didn’t have anything to do with you, at all or for the most part, so you could not have been blamed. It’s also how deniers get past things that they shouldn’t if they had any sense, conscience or some other things they should have. They just deny any of it was their fault. Some of this I know to be a biological deficit, like a dysfunctional amygdala part of your brain (the reptilian part that is more animal like in reactive emotion and short-term intuition based). Some people can’t tell when they’re hurting others, physically even, never mind emotionally. But even when told, they brush it off like they didn’t know better or it wasn’t their fault (that defense of “insanity” where the person didn’t have full control of his/her actions), and all is just fine to them. Anyone normal would at least be shocked and remorseful at the impact, even if they did lose their minds for the incident. Not them. Finally, for myself, being able to justify things always makes me feel better, though I try hard not to tell myself lies, and have a motivation to learn and self-improve that blaming myself doesn’t quite have the same negative impact it does on most. It’s kind of motivating to me. Gilbert et al. (1998). Immune neglect: A source of durability bias in affective forecasting. Journal of Personality and Social Psychology, 75, 617-638. Getting enough to have enough income to meet the basic needs and a little extra will bring you more happiness than not having enough for that. However, beyond $75,000 in the US (2009 dollars), happiness levels out. People start hanging out with richer people as they get there and just want more, like once being happy with a $75k job but then at $100k job wanting a $250k job. That comparison seems to be the main factor why people aren’t as happy these days as in 1942, when there was far less things to entertain us, and social media only accentuates that. There is also very poor correlation between life satisfaction and income, with correlation being r = 0.1. That means you might as well throw glitter at the wall and the points would be about the same as the graph showing income and life satisfaction on the two axes. Interesting, the correlation is better in poorer nations, where there aren’t as much resources to help the poor as in richer nations, so every penny from $0 income means more than in richer nations where there could be welfare, employment insurance, food banks, and other services for the poor. So work to earn some level of income where your basic needs and a little extra can be met without worry about money, and then try not to think about money or what others have (especially via social media) to try and compete with. Check out all these resources below for more on how money has limited impact on happiness, and next to none beyond a certain point. LinkedIn Survey (2014). 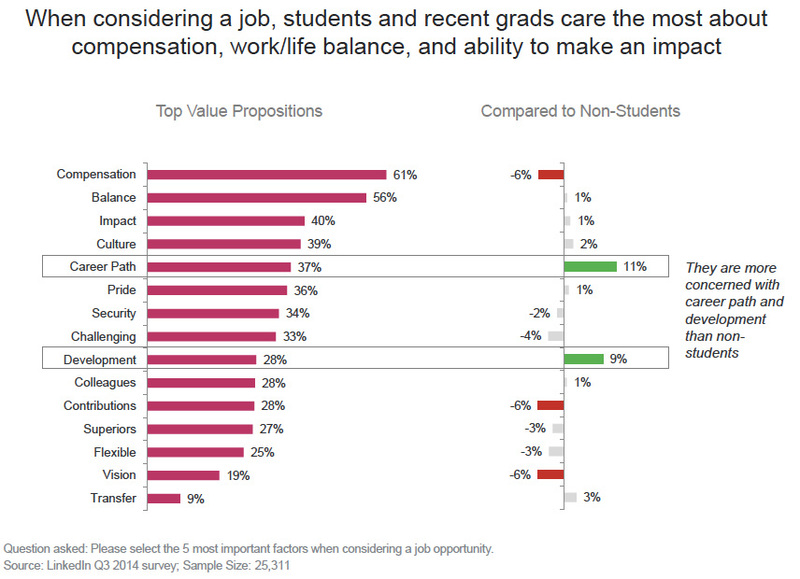 What recent grads care the most about. Lyubomirsky (2007). The How of Happiness: A New Approach to Getting the Life You Want. New York, NY: Penguin Books. Eagan, et al. (2015). The American Freshman Survey. Higher Education Research Institute, Page 53, Weighted National Norms—All Respondents. Myers (2000). The American Paradox: Spiritual Hunger in an Age of Plenty. New Haven, CT: Yale University Press. Diener & Oishi (2000). Money and happiness: Income and subjective well-being across nations. Culture and Subjective Well-being, Cambridge, MA: MIT Press. Kahneman & Deaton (2010). High income improves evaluation of life but not emotional well-being. PNAS, 107(38), 16489-16493. When people say “if I only had _____, I’d be happy”, it turns out when they get it, they’re not really any happier in a lasting sense. We’re talking about material things in the blank here, with more immaterial “things” to come. People who are also more materialistic in believing this also generally unhappier than the population, partly because they fail or fall short in what they really want (e.g. new car but not Mercedes-Benz), and develop more mental health disorders. Wow! Nickerson et al. (2003). Zeroing on the Dark Side of the American Dream: A Closer Look at the Negative Consequences of the Goal for Financial Success. Psychological Science, 14, 531-536. Lucas et al. (2003). Reexamining Adaptation and the Set Point Model of Happiness: Reactions to Changes in Marital Status. Journal of Personality and Social Psychology, 84(3), 527-539. Weight loss is the most common thing people want to change about themselves. That is covered here for having a more perfect body, but also some surgery. Weight loss was particular interesting because people who actually lost weight in a program, were less happy some years later than those who didn’t! I suspect keeping off the weight might have contributed to this, having gotten a taste of what your body could have been like with less weight, but you can read the references below for more info. To be fair, though, it seems most people who went through weight loss programs were less happy later, just not as less happy as those who succeeded in the program! Seems like accepting their bodies they way they were got harder, whether the participants succeeded and then failed to keep it up, or didn’t succeed via no loss or even weight gain in such a program that they failed to start with. Cosmetic surgery doesn’t require the same effort where you can fail at it, but those who got it also end up being less happy than before, and the general population as well. Unlike things like a job where you could blame others and/or stupid “things” you couldn’t have controlled, I suspect these things make people feel worse because they couldn’t really do that. For weight loss, other people will have succeeded so they can’t blame too many stupid things. For surgery, the surgeon is generally qualified to do what they want, and they would probably be a bit happier after getting the surgery, seeing the results, but later, it’s only them to blame for whatever they’re still not happy with, whether what got fixed or some other thing now being desired to be fixed. Jackson et al. (2014). Psychological changes following weight loss in overweight and obese adults: A prospective cohort study. PLOS, 9(8): e104552. von Soest et al. (2012). Predictors of cosmetic surgery and its effects on psychological factors and mental health: a population-based follow-up study among Norwegian females. Psychological Medicine, 42(3), 617-626. The happiness scale rating here was 1-9, which was different from the one used for the jobs study, but that’s just for context. People here thought they’d be about 0.6 points more happy for a better grade, and about 3.4 points less happy for a lower grade, with 7.81 (pretty happy) if the grades were as expected. Turns out, when they got their grades, the score was 6.45 for the expected grade, with barely a 0.1 point difference down or up for grades better or worse than expected, respectively! All of 0.1 point ! Now, that said, you should not avoid caring about your grades because despite doing jobs well and keeping jobs ultimately coming down to skills and experience, not grades, getting jobs when you first get out of school will depend more on your grades, even if indirectly. Someone might not check your grades, but if the skills you needed were learned in school, and you didn’t do well at them, it’ll probably show in your interview and/or tests you might get put through for the job! Levine et al. (2012). Accuracy and artifact: Reexamining the intensity bias in affective forecasting. Journal of Personality and Social Psychology, 103(4), 584-605. So why do we still have misconceptions? That’s not a simple question, but it seems the simplest answer that can be given is that it’s about 50% genetics, 10% life circumstances, but 40% on your actions and thoughts! So while your actions and thoughts aren’t the dominant factor in the grand scheme of things, but 40% is not negligible, either! It’s a pretty good portion that you can do something about, which is the premise of this course in that you can do something about it, as well as do the RIGHT things, which is not pursuing those goals described above that most people thought would make them happier, but don’t. How I interpreted the GI Joe Fallacy of “knowing is half the battle” was that you can’t win half a battle. You either win it or you don’t, and that’s where the actions come in. However, there is value to me in knowing all these things, which is preparation for the battle, to use the same analogy. More literally, that comes in the form of expectations. I don’t like the word “moderating” for how to change your initial expectations because it sounds like you’re settling for something less, when it can be just something different. I’ll use an example of one of the other things we often get wrong for expecting increased happiness, among the many listed by Professor Santos. I call those the Average Joe Fallacies, to play on words vs GI Joe, to represent the majority of society. For weight loss, instead of expecting weight loss, or more likely a certain amount of weight loss, how about expecting a real good effort to lead a healthier lifestyle with respect to diet, exercise, habits like smoking, try to reduce stress, etc. and see where that will take you instead? Work on it in small steps so you can keep your gains rather than a drastic change that isn’t sustainable. Don’t set a time like 6 weeks when you can work on it for much longer. Whatever you may lose then for weight, or maybe not because that’s the way your body is, but healthier now, be happy with that. Weight loss isn’t always the healthy solution! With this, or working hard on grades, etc. where you should be less happy, is if you didn’t put in even a good effort, never mind the best effort, where then you had let yourself down… but don’t even let that keep you down. Get up and try again. Failure isn’t about falling down, it’s about not getting back up.